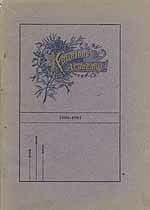 31st Annual Catalogue of Keystone Academy, A School Home for Young Men and Young Women. Factoryville, Pennsylvania, 1900-1901. Note: The name of the college which the graduate entered is given. Names in this online transcription include Ainey, Allen, Anthony, Archbald, Armstrong, Ayres, Bailey, Bard, Barnes, Barrett, Beale, Beardsley, Beer, Bennett, Beveridge, Biddleman, Billings, Bodle, Bond, Bonner, Bower, Brown, Browning, Brundage, Bunnell, Bush, Button, Callender, Capwell, Carpenter, Carr, Caterall, Catterall, Chappell, Chase, Coleman, Colvin, Cook, Cooper, Cornell, Cramer, Crane, Cure, Dale, Darrow, Davies, Davis, Dawson, Day, Dean, Decker, Dennison, Denny, Depue, Dershimer, Dickerson, Dilley, Downey, Downing, Dunklee, Eggleston, Engle, Evans, Farnham, Fassett, Finn, Fitch, Foley, Foster, Frear, Gardner, Gay, Gaylord, Geary, Gerould, Gibbs, Gorr, Gramps, Gray, Green, Griffin, Griffiths, Groff, Haag, Halstead, Hankins, Harding, Harlos, Harris, Hart, Hartley, Heim, Heller, Hendrick, Henning, Henwood, Hillier, Hinds, Holland, Honeywell, Howe, Hughes, Hull, Hulley, Hunt, Ingalls, Jacobs, Jayne, Jones, Keeler, Keller, Kellogg, Kemmerer, Kennedy, Kenney, Lamb, Lane, Langstaff, Langworthy, Lappeus, Leach, Leber, Ledyard, Lee, Leighton, Leinbach, Leonard, Lilley, Lilly, Lindley, Little, Lloyd, Lowry, Luchsinger, Mace, Mackey, Maclay, Mallery, Manchester, Manning, Marsh, Marshall, Mathewson, Maxey, Maynard, McCain, McNeil, McWade, Menger, Mentzer, Miles, Miller, Morgan, Mucklow, Mumford, Muraford, Newcomb, Newton, Northup, Nye, Olds, Osterhout, Owens, Paterson, Pearce, Pease, Peck, Phillips, Pike, Plush, Potter, Powell, Quevedo, Race, Rainey, Read, Resenkranz, Reynolds, Richard, Rifenbary, Rinker, Rivenberg, Rivenburg, Rosenkranz, Sayles, Scott, Seamans, Shaw, Shelley, Shields, Shoemaker, Sickler, Simrell, Sinsabaugh, Sisson, Slocum, Smiley, Smith, Snyder, Southworth, Spencer, Sprague, Squier, Stanton, Stark, Stephens, Sterling, Sterns, Stevens, Stewart, Stone, Streeter, Strong, Sumner, Sutton, Suydam, Swallow, Swartz, Taylor, Tedrick, Tennant, Thaoo, Thayer, Thomas, Thompson, Tiffany, Tilden, Tillinghast, Tingley, Townsend, Tucker, Tulley, Van Fleet, Viall, Waite, Waldie, Wall, Walter, Warren, Washburn, Watkins, Watson, Weaver, Welch, West, Wetherby, Wheaton, White, Whittemore, Williams, Wilson, Wintermute, Worden, Worth, Wrigley. The Genealogy Today catalog number for this item is 15953. When inquiring about the information in this resource, please mention the catalog number.